GPU Caps Viewer 1.41.0.0 has been released. + added NVIDIA Titan RTX support. OpenCL, CUDA and OpenGL data is linked to the selected GPU. Useful when you have an Intel GPU + an NVIDIA or AMD GPU.
! updated: ZoomGPU 1.22.2 (GPU monitoring library). There is a wrong EUs number for my HD630, it should have 24 EUs. Indeed the number of EUs should match the CUs in the OpenCL field. 24x8=192 - somewhere in the code bits and bytes are mixed up? 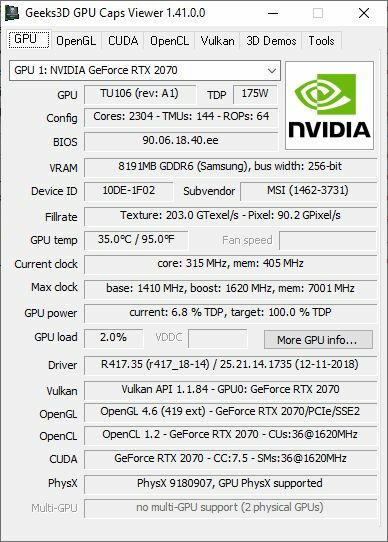 I updated the GPU info in new GPU Caps Viewer 1.41.1.0 . So far, I displayed the number of cores and called them Execution Units which was wrong. Now, the number of cores and executions units are displayed at the same time. A maintenance release of GPU Caps Viewer is available.
! Intel GPUs: now the number of cores and EUs are displayed in the GPU panel. of PowerTune info (OverDrive5 only) in the GeeXLab GPU monitoring plugin.
! updated: ZoomGPU 1.22.3 (GPU monitoring library).
! Intel GPUs: only EUs are displayed in the GPU panel. Iris Plus Graphics 655 GPUs.
! updated: ZoomGPU 1.22.4 (GPU monitoring library). A new maintenance version of GPU Caps Viewer is ready. + added support of NVIDIA GeForce RTX 2060. - dropped support of Windows XP.
! updated: ZoomGPU 1.22.5 (GPU monitoring library). I meet a problem and need help. When I run GPU Caps Viewer 1.41.3 with 3D Demos - OpenCL CPU - 4D Quaternion Julia Set, it popup "OpenCL CPU not supported on the selected platform". Does it mean my CPU is not support? My system is a Laptop and that is Intel CPU + NV GPU, thanks. 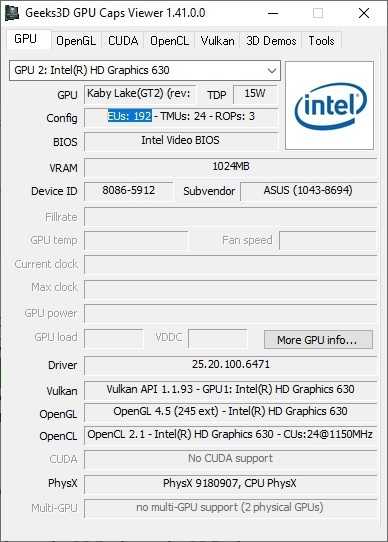 If your graphics drivers (Intel + NVIDIA) are correctly installed, you should have OpenCL CPU+GPU on Intel platform and OpenCL GPU on NVIDIA platform. Then you have to select the device you want at the bottom of the OpenCL panel and run the demo. Also, look at this article, maybe it contains few hints that will help you. Moreover, when some tests do post the results, they don't seem to be appending on the same file. Thanks, I will look at the issue for the next release. Any estimated time on the fix? This problem still exists on the latest - 1.42 version.